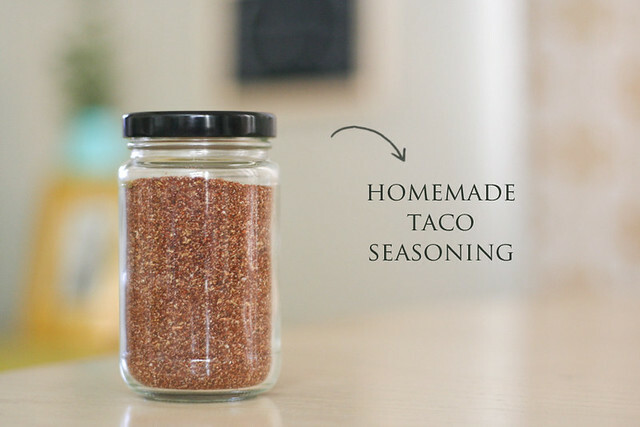 I am by no means the first person to make taco seasoning from scratch, but as I transition to more homemade/DIY/from-scratch versions of things I often use, I thought it would be fun to share my favorites here on the ol' blog! At this point in life, I use those little taco seasoning packets enough that I figured now would be a good time to try a homemade version. (We use them most for taco soup, seven layer dip and to season refried beans or veggie crumbles for burritos.) After a quick Pinterest search, I came across this recipe from Smashed Peas and Carrots. I was short only one ingredient for this recipe (onion powder!) which I picked up yesterday. Because I've done more cooking in the past couple years, I find that I'm actually using spices on a regular basis and finally know how to use them (for the most part). 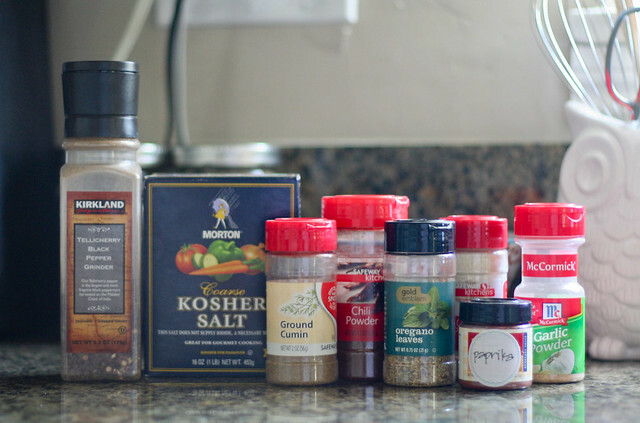 Anyway, the point is, the entire recipe is made from fairly normal seasonings, so it's not like you'll be buying a bunch of stuff you'll never use again. That would kind of defeat one of the main purposes of making something from scratch. Right? Right. 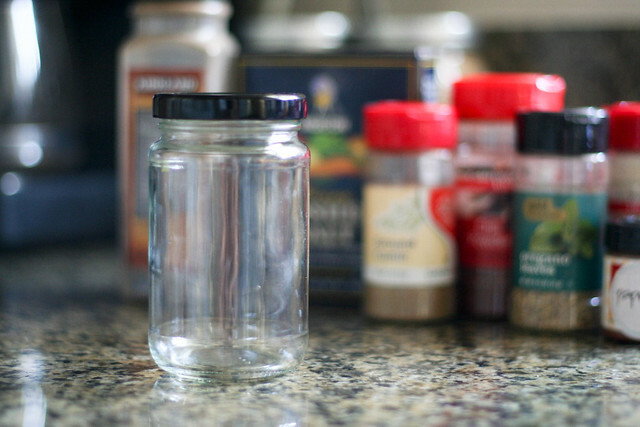 I ended up doubling the recipe here, and it filled this jar (which used to hold jam) almost to the top—as seen in the very first photo. You can store it up to 6 months, and you only use 2 rounded tablespoons of this mix in place of one taco seasoning packet. Sounds good to me. Once it is not 90+ degrees inside our kitchen (October heatwave, anyone?) I plan on immediately making some taco soup. I will let you know what the verdict is! I've been making my own taco seasoning for awhile now and it tastes so much better then the stuff in the packets. I normally make it on demand but this is a great idea! Now to find a cute jar to make it in! 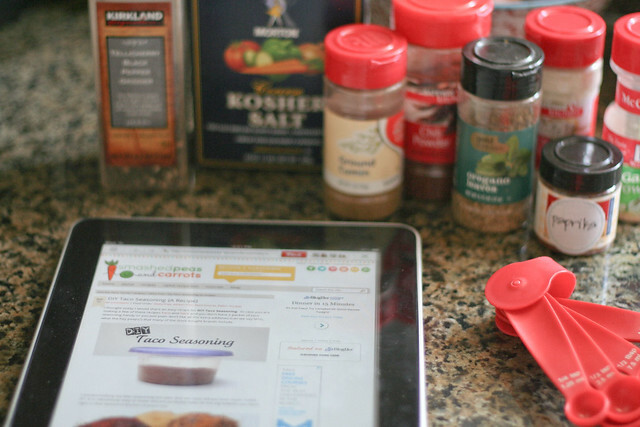 Perfect timing - I was just wondering about a homemade taco seasoning mix yesterday and was about to go troll Pinterest to find one. Thank you for sharing!